In the realm of horror movie royalty, Frankenstein resides way, way near the top; if it’s not #1, it’s at least a top ten’r, maybe five’r. And even if its ability to scare has almost-certainly diminished in this more-jaded movie-going age, it still easily and aptly holds up as a genuinely great, great film, one that supports more than a few iconic moments and has basically become the veritable symbol of Halloween (you know, today). 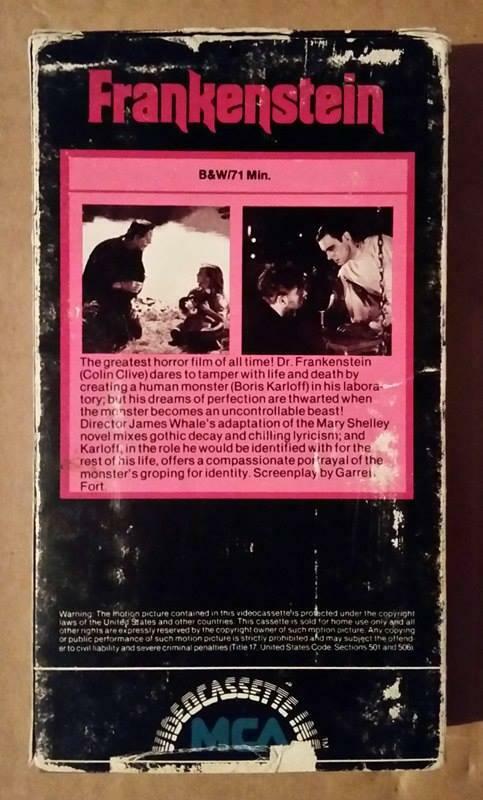 This was put out my MCA Home Video (then billed as MCA Videocassette Inc.) in 1980, and while Frankenstein was by no means a ‘new’ film even then, it’s wild to realize it hadn’t even hit 50 years old by that point. It’s now 86 years old, and this tape itself is closer to 40 than it isn’t. I’m not sure where I’m going with all this. It’s an old VHS of an old movie that wasn’t quite as old 37 years ago as it is today, okay? There, wrap your mind around that! Although they’re a more-protected species nowadays, at the time these Universal classics were still widely seen on local stations, regional horror hosted programs, and so on and so forth. But to actually own an official copy of the film, to pull it off the shelf whenever you darn well felt like it? That’s something we totally take for granted nowadays, but for classic horror fans in the early years of home video, I’m just not sure it got much cooler than that! ‘Course, while there are some differences in the print here, which we’ll get to, it’s not like this movie was unique to one specific era of home video; nowadays, you can get the film itself or the entire series on DVD or Blu-ray. I find it hard to believe that anyone reading this post hasn’t seen Frankenstein, but if by some chance you haven’t, you really owe it to yourself to pick up a minty fresh new copy right quick. Anyway, this tape. Anyone familiar with the later video releases of not only this movie but the other Universal classics will recall how elaborate and striking their covers often were, sometimes even utilizing original poster art. Gene Shalit could even show up, too. As such, the relative sparseness of this release is a little striking; it’s the kind of tape that really could have only come out in those first few years of home video. Not that it’s bad, mind you. The mostly-purple & black color scheme is attractive and gives off the appropriate vibes one would associate with a movie of this nature. Ditto for the tinted close-up of Frank’s mug. I like the semi-Gothic (?) font used for the title, and I’m by no means a “font guy.” It’s just, like I said, the whole thing feels a little sparse compared to what was to come, though that’s no one’s fault; video covers would soon become increasingly eye-catching – the simpler, earlier days of the format soon gave way to big ol’ boxes and legitimately striking artwork, all in an effort to entice prospective buyers/renters (obviously). I guess what I’m saying is that this release could have only come out in those first few years of video. Wait, I already said that! Well, it still holds true. If not the film as a whole, then at least the actual character of Frankenstein (or “Frankenstein’s Monster,” for all you technical types) has become, arguably, the most famous of Universal’s many many monster movie (alliteration) creations. It stands to reason this original flick (along with fellow-perennial-favorite Dracula) was among the first released on home video by MCA. Frankenstein‘s sequels had to wait a bit longer to come to VHS, however; for example, The Ghost of Frankenstein didn’t show up until 1993! The back cover continues the color scheme, along with two shots from the movie and the expected description. Be happy there even was a description; some early video releases used the back cover primarily to hawk other titles from the company. The description here is pretty good, giving just enough exposition to draw the buyer-renter/whoever in and nailing the hype without ruining the movie. And look! Says right there: “The greatest horror film of all time!” Told ya! HOWEVER, since the footage hadn’t been rediscovered (or at least added back in) yet, of course the first few video releases were of the older, non-restored print, and needless to say, that’s what we have here. Now, naturally I’d never argue that Frankenstein should definitively be seen in this form, but it’s absolutely fascinating to see the version that was it for decades, and which is now, you know, not. While on the subject of the print, Frankenstein has been restored and remastered over the years, and the result is that the version we have today looks pretty stunning; Universal has treated these films well! Even if you just watch one of them on Svengoolie, you’ll usually see something pretty crisp and clean – Universal does good work, and as far as Sven goes, they often provide upgraded prints as they come along, too. So, do I really even need to describe Frankenstein? Even if someone hasn’t seen it (yeah, uh huh), they know the basic storyline. Even though this film was adapted from Mary Shelley’s 1818 book, this Universal adaptation, which deviates wildly from the source, has become the iteration burned into the synapses of the public. When people think “Frankenstein,” 99.9% of them think of Boris Karloff’s immortal portrayal here. And the plot? The story has become a horror staple; people know the background and the monster even if they haven’t seen this 1931 masterpiece. The plot concerns one Henry Frankenstein, a scientist who believes he has discovered the secret to reanimating life. As such, he, along with his hunchbacked assistant, go about stealing dead bodies and piecing them together. You know, an arm here, a leg there. (As I said before, we live in a more-jaded age, but worded like that, it still sounds pretty grisly.) Things take a wrong turn when, as the final piece of the puzzle, the assistant steals an abnormal brain. (You’re thinking of the Young Frankenstein gag right now, aren’t you?) Henry, via lightning storm, succeeds in giving the mass of body parts life, bad brain and all. If there’s one image from this movie that can be considered the most iconic in a film full of iconic moments, it has to be Henry’s exclaiming “IT’S ALIVE!” when the creature begins to stir. Trouble, of course, soon follows. And that brings us…Boris Karloff. His portrayal of the monster is an absolute marvel; a creature capable of death, destruction and vengeance, but at the same time, also humanity. The fact he does this with no real dialogue is amazing. Yes, the monster has a deranged mind, he kills, but there’s also a real gentleness about him; watch early on, soon after he’s first reanimated, and sunlight is let in through the roof – the creature futilely reaches up towards it, and it’s just an incredible moment. 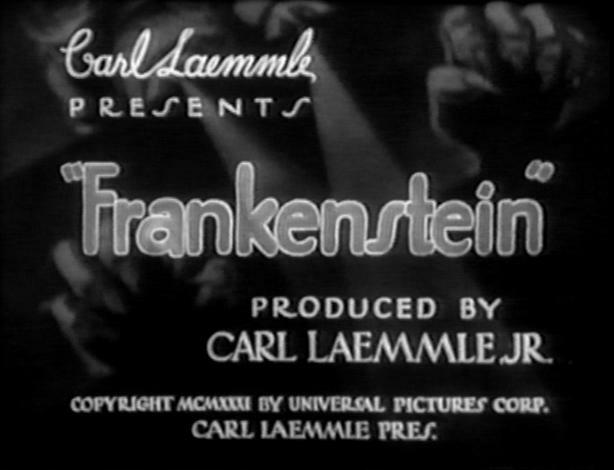 Indeed, one of the great tragedies of this older print is that some of that humanity is obscured – the scene where he accidentally drowns Maria is a chief example, and though only a very small moment in the overall film, it’s a very important one, which is why the later, restored versions of Frankenstein are such a triumph. And how about that make-up! There have been numerous depictions of Frankenstein’s monster over the years, but only one that continually sticks in the mind of the people, and that’s Karloff’s portrayal here. Sunken cheeks, flat head, bolts in the neck, the whole shtick; c’mon, you already know how he goes! Many people point to 1935’s Bride of Frankenstein as topping the original. I can understand that thought, but I still gravitate to this first film, though the monster’s newfound power of speech in Bride makes for some iconic screen moments. 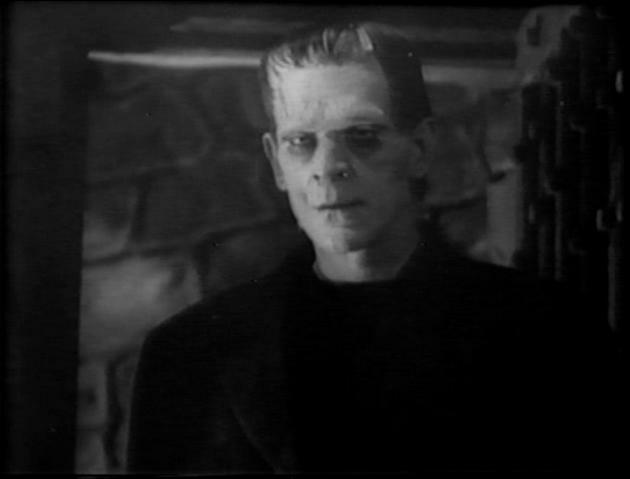 At any rate, the first three movies in the series (this, Bride, and 1939’s Son of Frankenstein) feature Karloff as the monster, and he’s fantastic in each one. Those are terrific movies in general, though I love this series as a whole (and have a particular soft spot for 1942’s The Ghost of Frankenstein). Still, it all comes down to this original Frankenstein. This is the kind of movie horror films are built upon. No joke, it’s quite possibly the perfect Halloween movie, rivaled only by Night of the Living Dead. But whereas Dead is a gritty, nihilistic late-1960s social commentary, Frankenstein is, in my mind, the definitive horror film of Hollywood’s golden age. Both are great, but for pretty different reasons, even if they do both share the whole “reanimated corpse” theme. Frankenstein, to me, is the horror film of that era in Hollywood; evocative sets, a fantastic storyline, unforgettable acting, a budget. Everything about it is just right. It draws you in from the first scene and never lets you go. How can anyone not love it? So, to have the movie here in what is probably the first edition released on VHS, it’s not just a cool collectible, nor is it just a cool relic of home video’s past. I mean, it is all that, but it’s also a piece of horror movie history; the first time consumers could own the movie for home use, authorized and officially. As I said before, I’m not sure it got much cooler than that! And with that, our big Halloween update comes to a close. Have a happy and safe holiday, everybody! And hey, why not throw 1931’s Frankenstein on at some point, whatever version you may have? 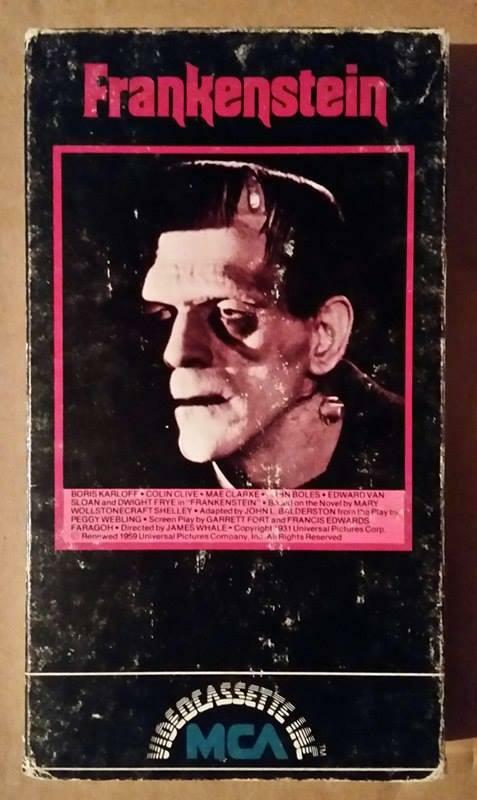 This entry was posted in Uncategorized and tagged 1931, 1980, 1980 vhs, 1980s vhs, 1st vhs, beta, betamax, boris karloff, classic horror, early release, early vhs, film review, first vhs, first video release, Frankenstein, frankenstein 1931, frankenstein 1931 review, frankenstein 1980 vhs, frankenstein early vhs, frankenstein first vhs, frankenstein karloff, frankenstein review, frankenstein vhs, horror movie, movie review, overview, review, science fiction, vhs, vhs release, vhs review, video, video cassette, videocassette on October 31, 2017 by neovideohunter.